Selected as a finalist for the 2015 Arthur Ellis Award for Best First Crime Novel and for the 2015 Kobo Emerging Writers Award for Genre Fiction—Mystery. The head of the Canadian High Commission’s trade section is found brutally clubbed and stabbed to death in the Official Residence in London, England. Scotland Yard’s Detective Chief Inspector Stephen Hay is called in to investigate, while Royal Canadian Mounted Police Inspector Liz Forsyth is dispatched from Ottawa. There are a number of suspects from the diplomatic community: the High Commissioner and his beautiful wife, the smarmy head of the political section, the charming military attaché, the high-strung Deputy High Commissioner, and a deeply troubled engagements secretary. After a second murder, the case takes a turn and radical environmentalist Dr. Julian Cox becomes a suspect. 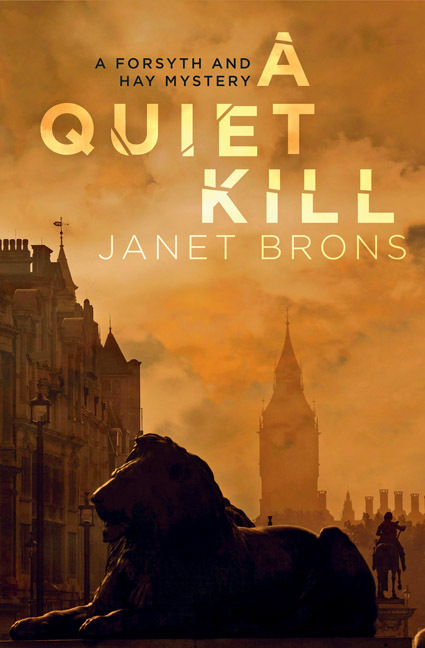 A Quiet Kill is the first in a new mystery series featuring Forsyth and Hay. Paired up for the first time, the two investigators must overcome insecurities and suspicions as they find themselves wading into the murky waters of the diplomatic community and navigating through a melee of international conspiracy, nationalism, and murder.